According to Spanish media outlet, AS via Sport, Real Madrid are willing to splash the cash this summer to secure the services of Brazilian superstar Neymar. Arguably, Neymar has been the best player for Paris Saint-Germain since his move to the Ligue 1 giants back in 2017 for a world record fee. Before suffering a metatarsal injury a few months ago, the 27-year-old forward has racked up 13 goals and 6 assists in Ligue 1 and 5 goals in just six appearances in the UEFA Champions League. Neymar currently has three years left on his contract with PSG, which will end in 2022. On the other hand, Real Madrid is already out of the Copa Del Rey and Champions League and has little hopes to secure the La Liga as they sit third on the table- 12 points behind leaders Barcelona. PSG suffered another Round of 16 elimination from the Champions League against Manchester United last week in the absence of their star player. 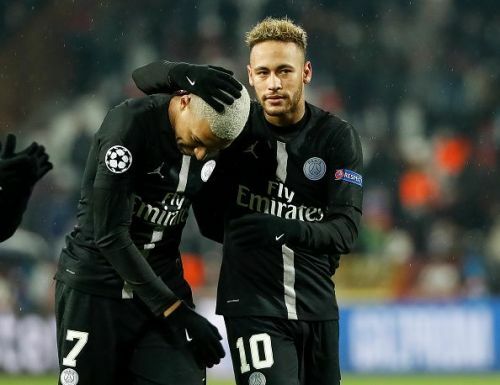 There were already reports linking Madrid to Neymar and Kylian Mbappe, who were obviously frustrated after their shocking defeat. According to the report, Real Madrid president Florentino Perez is ready to shell out a whopping €350 million in order to get Neymar at the end of this season. The Brazilian star earns €36 million per year but Perez is ready to offer him pay more wages- around €45 million- to persuade him to join Los Blancos. Meanwhile, Neymar recently flaunted his admiration for Real Madrid claiming it is the biggest club in the world and hinted that his future is uncertain in a recent interview. Florentino Perez is looking to revamp Los Blancos with new faces and buying a match winner like Neymar will only strengthen their squad. There is not an ounce of doubt about Neymar's capability and it is obvious that he would be an asset to any team. Real Madrid will face Real Valladolid and Celta Vigo, while PSG will face Dijon and Marseille in their respective leagues in coming weeks. Can Real Madrid afford to buy and keep Neymar?